Chase Field is the site of the matchup between the Miami Marlins and the Arizona Diamondbacks on Saturday, September 23, 2017. The probable starting pitchers are Dillon Peters for the Marlins and Taijuan Walker for the Diamondbacks. Miami opens at +135 while Arizona opens at -145. The Marlins have a 78-63-11 over/under record and a 77-75-0 run line mark. The Diamondbacks are 83-70-0 against the run line and have a 68-77-8 over/under record. The Marlins have a 72-80 overall record this season. Starting pitcher Dillon Peters has a 0-2 record with an earned run average of 5.40 and a WHIP of 1.66. He has 22 strikeouts over his 21.2 innings pitched and he's given up 24 hits. He allows 10 hits per 9 innings and he has a FIP of 3.66. The bullpen has an earned run average of 4.37 and they have given up 560 base hits on the year. Teams are hitting .254 against the bullpen and they've struck out 528 hitters and walked 247 batters. As a team, Miami allows 9 hits per nine innings while striking out 7.6 batters per nine innings. They are 23rd in the league in team earned run average at 4.73. The Marlins pitchers collectively have given up 1,353 base hits and 713 earned runs. They have allowed 176 home runs this season, ranking them 23rd in the league. Miami as a pitching staff has walked 576 batters and struck out 1,139. They have walked 3.8 men per 9 innings while striking out 7.6 per 9. They have a team WHIP of 1.42 and their FIP as a unit is 4.60. As a team Miami is hitting .264, good for 5th in the league. The Marlins hold a .427 team slugging percentage and an on-base percentage of .328, which is good for 12th in baseball. They rank 6th in MLB with 9.1 hits per game. Marcell Ozuna is hitting .308 with an on-base percentage of .370. He has 178 hits this season in 578 at bats with 115 runs batted in. He has a slugging percentage of .540 and an OPS+ of 141. Giancarlo Stanton is hitting .279 this year and he has an on-base percentage of .378. He has totaled 155 hits and he has driven in 120 men in 555 at bats. His OPS+ is 165 while his slugging percentage is at .634. The Marlins have 1,385 hits, including 243 doubles and 184 home runs. Miami has walked 450 times so far this season and they have struck out 1,203 times as a unit. They have left 1,054 men on base and have a team OPS of .754. They score 4.68 runs per contest and have scored a total of 711 runs this year. Arizona has a 88-65 overall mark this year. With an earned run average of 3.45, Taijuan Walker has a 9-8 record and a 1.32 WHIP. He has 134 strikeouts over the 148.2 innings he's pitched. He's also given up 139 hits. He allows 8.4 hits per nine innings and his FIP stands at 4.06. The bullpen has an earned run average of 3.85 and they have given up 416 base hits on the year. Teams are hitting .236 against the Diamondbacks bullpen. Their relievers have struck out 453 batters and walked 174 opposing hitters. As a team, Arizona allows 8.1 hits per nine innings while striking out 9.3 batters per nine innings. They are 3rd in the league in team earned run average at 3.61. The Diamondbacks pitchers as a team have surrendered 1,226 base knocks and 547 earned runs this season. They have given up 160 home runs this year, which ranks 29th in Major League Baseball. Arizona as a staff has walked 482 hitters and struck out 1,404 batters. They give up a walk 3.2 times per 9 innings while they strike out 9.3 per 9. Their team WHIP is 1.25 while their FIP as a staff is 3.76. As a team, they are batting .253, good for 18th in the league. The Diamondbacks hold a .441 team slugging percentage and an on-base percentage of .327, which is good for 14th in baseball. They rank 17th in MLB with 8.6 hits per contest. David Peralta comes into this matchup batting .294 with an OBP of .348. He has 147 hits this year along with 52 RBI in 500 AB's. He maintains a slugging percentage of .446 with an OPS+ of 99. Paul Goldschmidt is hitting .305 this season and he has an OBP of .410. He has collected 162 hits in 531 at bats while driving in 117 runs. He has an OPS+ of 146 and a slugging percentage of .576. The Diamondbacks as a unit have 1,321 base hits, including 297 doubles and 204 homers. Arizona has walked 533 times this year and they have struck out on 1,386 occasions. They have had 1,047 men left on base and have an OPS of .768. They have scored 4.93 runs per game and totaled 755 runs this season. 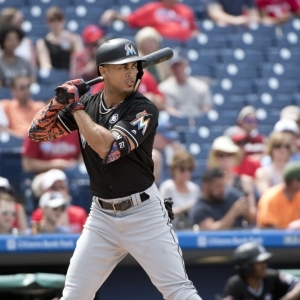 Who will win tonight's Marlins/Diamondbacks MLB game against the spread?